* It contains ML settings, module settings, pretty much any kind of settings except Canon ones. * To choose a preset, you just change the settings directory. As long as code requiring some files with settings does not hardcode ML/SETTINGS, but uses get_config_dir() instead, it should work out of the box. - Linked to the shooting mode (from the mode dial) selected at startup (so you have a preset for M, another for Av and so on). 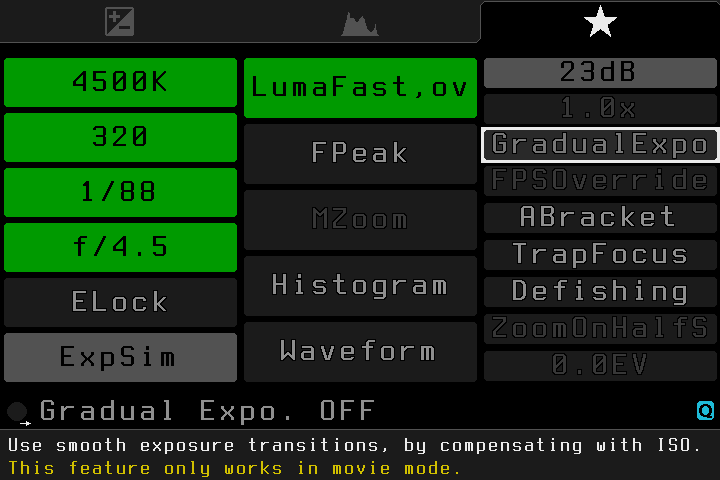 * The preset name is always displayed in the menu, in a corner. * Changing the preset requires reboot (to keep things simple and robust). * You may want to move ML/MODULES/*.CFG and *.EN to ML/SETTINGS (or just delete them and start fresh). * Right now there's no way to create new named presets from menu (you need to do this on the PC). * 5D2/50D do not have a dedicated switch for movie mode (they always start in photo mode). This means you can't have a preset for movie and another one for photo on these cameras (even if the menu may suggest you can). It might work if you press LiveView fast enough at startup (didn't try this). Changing the preset requires reboot (to keep things simple and robust). Hmmmyes, that was to be expected after what you've already written before, and it certainly makes the mode-dependent presets less practical - but the implementation sounds very nice and thought through, I'm keen to give it a try (well, as soon as 1% pulls it into his fork so it's on my 6D :-p)! If you didn't already do it when selecting a different config - maybe implementing a soft reboot to switch configs would be a good idea so users don't need to power off the camera, wait some (otherwise it might not have reboot), and then switch it back on again? Hard to keep up with you guys! The Your development speed outpaces the my learning speed! Thanks for this, very appreciated. is activated. MENU and PLAY buttons are working. Most likely the INFO key event is not sent if you hold the key during startup. Try pressing it a few times after starting ML, before the config gets loaded; maybe it will get caught this way. Also check if INFO works as expected in menu (it should attempt to display some help). Press INFO once after Canon's screen appears while sensor cleaning is running. EDIT: Help works as intended after pressing INFO in ML menu. INFO in liveview: No problems, too. What about popping up a menu at startup, where you can select a config preset by name? My one issue with the current preset system is not loading presets, but *saving* them - I'd like to have the choice to save the current preset to a specific mode/button. If I could give it a name and there's a nice loading choice menu all the better, but since a reboot is required anyway the mode/button solution is also quick if you can remember what config is where. You mean, start changing settings from preset A and save it as B? The concept seems very good but I would added as optional by pressing a button since I would not want this screen to come up every time. Absolutely! I find presets very useful to setup ML for specific functions i.e. Timelapse. This will allow beginners to quickly get results without the lengthy trouble shooting questions of How to? I suggested this a while ago and I would definitely be for it. Where magic happens!!! So useful! Is it already available in the nightly build? You may even use it. If you're talking about config preset selectable at startup as a menu: Nope. I'm not sure which one is the one for me. Basically what I'd like to do is alternate between two ML configs: one for RAW (with RAW Recording ON and FPS Override ON) and one for H264 (with RAW recording and FPS Override OFF). Can I do it with Config Presets in common? Yes, because they were made for such things. I cannot find information on how they work. Is there any guide for it? Maybe a dumb question, but are these 'config presets' options also in the a.d./pravdomil builds for Mk2? am just wondering what is the status of this module. is it still functional with current builds of ML? Using this for a while and thinking all the time, like Marsu suggested a year ago: maybe implementing a soft reboot to switch configs would be a good idea... and a +1 on this one! @a1ex: Looks like presets are not ordered alphanumerical but in order of time of creation. Is it possible to change behauviour? I just created an issue.